Remote sensing and geographic information system have long been recognized as versatile tools, to addressing sustainability issues connected with the development and management of groundwater. Applications of these in targeting groundwater in India have also come of age in as much as it has contributed to production and use of satellite imagery-based groundwater prospect maps. These maps, popularly known as hydro-geomorphological maps, are being used in managing drinking water sources and water supply schemes. 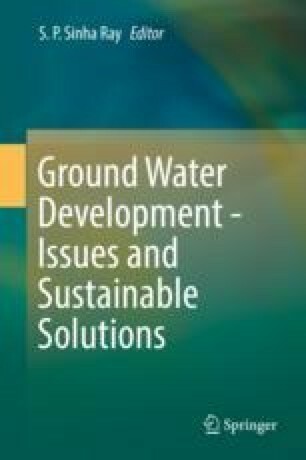 This paper outlines the current state of the art of aquifer detection keys of use in setting up drinking water supply bore wells, rainwater harvesting, and groundwater recharging structures toward providing sustainability to drinking water sources. This also reviews the role of remote sensing in the Government of India that sponsored ongoing integrated watershed development programs in various states. The paper also focuses on the general lack of skill on the part of planners and application engineers and scientists in the fruitful application and use of imagery-driven maps in water supply schemes. It may be worthy of its mention that images draped over digital elevation models provide exclusive imagery-driven products of use in groundwater and watershed development programs in various states of India. The land use-land cover, soil, and automated drainage delineations provide instant input to hydrologic models in estimating water and silt yield. The need to develop skill of engineers and planners engaged in the use of satellite imagery data and hydro-geomorphological maps to developing groundwater-based water supplies and integrated water management programs is an inescapable necessity for the successful implementation of water supply- and watershed-related schemes and programs in India. In recognition of this need, some recent training workshops have encouraged the use of satellite-based techniques in locating drinking water sources and strengthening of recharge systems in India.